A Dog Named Leaf is a unique story with implications that may shake some. Readers have called my experiences with Leaf provocative, entertaining, yet gut-wrenching. I hope this book will cause a paradigm shift in how people view possibilities for relating to other species. My hunch is that many others also have dogs as part of their families. They will be excited that someone has finally revealed the truth about what happens in homes every day--animals and people are connecting at levels of conscious awareness that confound anything science has been able to prove or replicate. Leaf and I are featured as the cover story in Southern California's Awareness Magazine. My wife and co-author Linda Anderson and I are bestselling, award-winning authors with 16 previous books that have been featured in mainstream media (O Magazine, Washington Post, Parade Magazine, USA Today, The Wall Street Journal, BBC Radio, Los Angeles Times, Today Show, Associated Press, Gannette News Service, etc.) as well as New Thought publications and an interview with Shirley MacLaine on her radio show. The book has been listed as an Amazon Bestseller Hot 100 New Release in Memoirs. A reviewer wrote, "This is about how a dog with great love actually entered the inner reality of his friend to help save him and was able to succeed where human explanations and efforts failed." I would like to share what happened as Leaf, my emotionally scarred rescued dog, and I came together at exactly the right time. After I found out I had both a brain aneurysm that could burst at any time and a blood clot aimed at my heart, this traumatized little dog and I became comrades battling for our lives. My story adds the twist of startling revelations about the ability of dogs to know the unknowable. New York Times bestselling authors! In 1996, Allen Anderson with his wife Linda founded the Angel Animals Network (www.angelanimals.net) to help people discover the miraculous benefits of human-animal companionship. Since then, Allen has co-written a popular series of sixteen books on the subject. Allen’s books have been recommended or featured in O Magazine and Oprah.com, Today Show, ABC’s Nightly News, Amazon.com’s Hot 100, and B&N’s Top 10. Allen has been interviewed for USA Today, Washington Post, NPR, and other national and regional media. 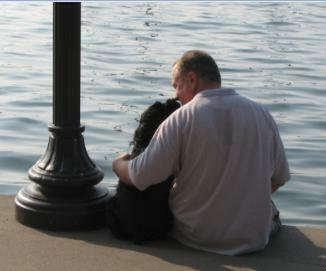 The inspiring true story of a man and a dog coming together at just the right moment for miracles to occur. 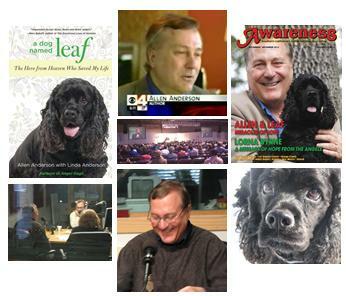 The American Society of Journalist and Authors (ASJA) has selected A Dog Named Leaf by Minnesota authors Allen Anderson with Linda Anderson (Globe Pequot/Lyons Press) as one of the winners of the prestigious 2013 ASJA Awards in the Lifestyle/Memoir category.